This particular class has a lot going on in it. I'm currently just able to keep up with what I'm supposed to be doing. I've been drawing lots of storyboards, which, as I have said, is something I enjoy doing, but they take time. I can't take the time to lovingly perfect each one, so it's a little on the frustrating side. We were given the assignment of a heart-touching story of a blind man trying to cross a busy street. I've been a little stuck in my animal-people motifs, so I created blind Mr. Mole (yeah, original name, I know) and set Wendell the Polar Bear and Vix the Fox into the scene with him. 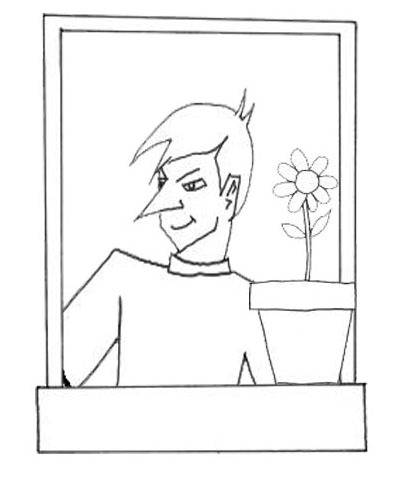 I started with an establishing shot - very important - and got all the characters in place. I have Mr. Mole standing at a street corner waiting for traffic to die down. Vix and Wendell join him on the corner. Mr. Mole is obviously nervous about the situation, and Vix notices it. She touches him on the should and offers her arm. Mole is visibly relaxed, and Vix and Mr. Mole cross the street arm in arm. 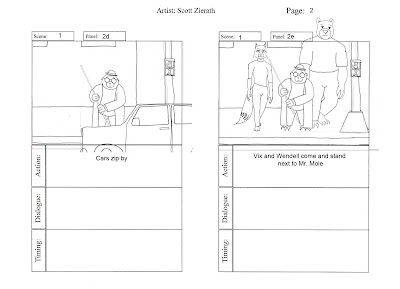 This was a quick, easy script, but still took several hours to draw the pictures, scan the pictures, clean them up just a little, and then put the individual pieces in the storyboard chart. 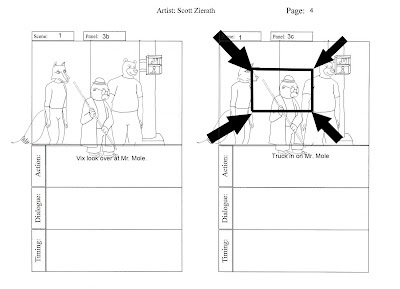 I am enjoying what I'm doing, and sometime soon I'll show some of the storyboards I've created for my own material, plus a few animated storyboards to get the sense of timing, but that will definitely be after this particular class is done. Having fun! 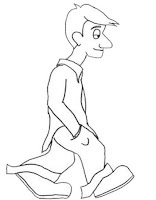 As part of this class, one of the first assignments was to create a walk cycle for a character of your choice. I chose one of my cartoon animals, Wendell. He actually represents me as a new UB full-time staff member. Yes, I have animal characters that represent me throughout my life. Sometime or another, I may introduce them all. At any, rate, I really wanted to talk about my animated character here. I was fairly proud of the walk, although I have to admit I lost track of one of his arms, so it jerks a bit instead of smoothly flowing. I've had some trouble posting videos here before. Hopefully, it works this time. When I said I knew my next 2d animation class was going to be time consuming, I knew I was right. By the end of the class, I will complete a 10 second looping short of a character - Sleepy Joe - doing something amusing. I spent a lot of time racking my brain to figure out what to do. It took me quite a bit of thinking to figure out what to do. I decided to create a secondary character - Sly Stu. Where Joe is a very rounded and relaxed character, I decided to make Stu similar yet opposite of Joe. Stu is very angular, tall, lanky, and conniving. 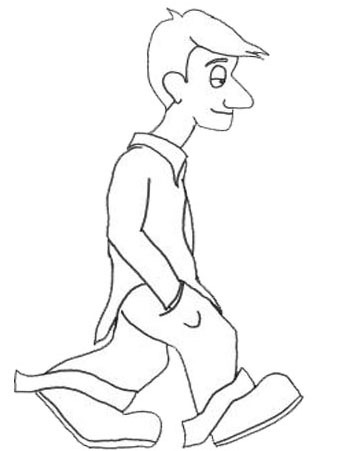 The storyline is that Joe is walking along. Stu can be seen in a second story room looking out and down at Joe. Stu has a 'Sleepy Joe Wanted poster.' So Stu drops a flower pot to hit Joe on the head. The pot misses, and Joe continues, seemingly oblivious to what is going on behind him. 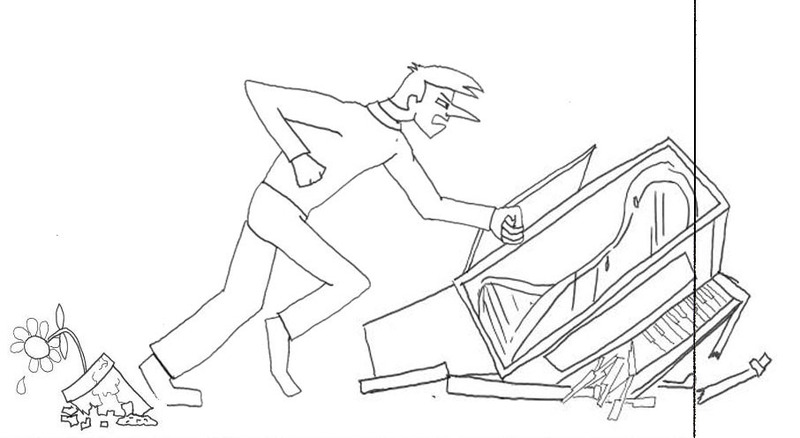 Stu is angry, and so he drops first a bowling ball and then a piano out of the window. 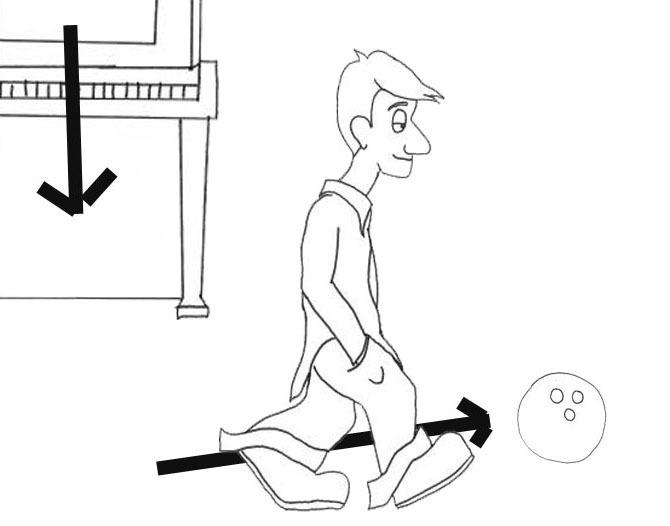 Joe walks on nonchalantly and the ball and the piano miss him completely. Stu is enraged. Stu races down to the street and chases Joe past the flower and the piano. 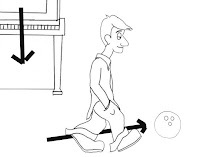 Joe catc hes up to the bowling ball, stoops down, picks it up, and then throws it. It conks Stu on the head, and Stu falls as Joe continues on. It's actually supposed to then flow into one of my classmates' 10 seconds, but we'll see what happens. I have been creating superheroes and superheroes stories for years. The first original superheroes I worked on were with a friend I made in fifth grade - Harley Jebens. For two years, he and I cranked out several comic books starring ourselves and our friends as superheroes. We started with the 'Platteville Protectors." We quickly came up with more global superhero group the 'Crime Crushers.' We even had our own imprint ' Jadz and Kops,' coming from the names of our little 'gang' of nuts. Harley was a much better artist than I was, and he patiently allowed me to scrawl my characters into the comics, too. I still have quite a number of the comics that we did, and I found out (through facebook), that he still has the others. Vision 2 (Mike Olds) with the ability to shoot ice out of his left eye and fire out of his right eye. We also had female teammates, but they were girls I had a crush on as a middle schooler, so they never knew they were in my comic books. As time went by, we added friends who were older or younger than we were, or some based on action figures we owned, including our brothers. In fact, my brother drew some of his friends as heroes in our books, too. At first glance, you may look at this little Christmas ornament and think, "Good lord, Zierath. Why do you keep such a banged up old ornament?" It's certainly a fair question. This used to be a little elf dude. He had a long nose, eyes, feet, a beard, a feather in his cap, and a vest. All that's left are a pair of bent up old glasses and the felt hat, and the string to hang it up on the tree. There are a number of reasons I have kept this poor beat up little ornament. One is that this is one of a pair that my Aunt Trish made for my brother and I. I think Maz still has the other one. I don't get to see Aunt Trish very often - once every couple or three years, but I love her dearly, and so all the ornaments she gave me are treasured Christmas items. The second is that this poor little ornament was left on the tree one year when I was in middle school. We took the tree out to the curb, never knowing this little guy was still on it. When they picked the tree up, the elf fell off. We didn't find him then. Months went by. The snow melted. We still didn't find him. It wasn't until I was mowing the lawn I found him. The glasses glinted the sun, and I stopped the mower and I picked him up. Now, I am a very sentimental man, and I look for lessons where ever I go. What lesson can this beat up old ornament give? Perseverance. Never give up. Never surrender. You can be beat down, dropped into the curb, run over by a lawn mower, and still have a place of honor on a Christmas tree. Even when I feel beat down, I have faith that my friends and family still have a place in their hearts for me and will continue to encourage me, just as I always intend on encouraging them, especially in their 'longshot' dreams. I just realized I had not posted the final image from my previous class. Here it is. Overall, I am extremely proud of my product. 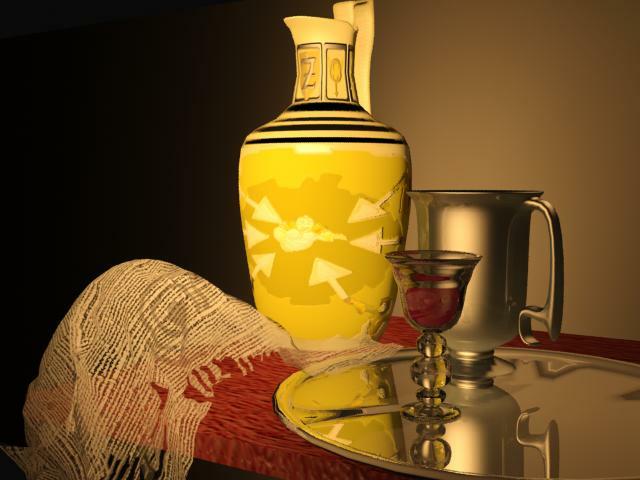 I learned a lot about texturing and surface illusions in computer design. I got some nice shading effects on the pitcher, and then the reflection in the platter especially looks nice. I am going to continue practicing, but I've made some nice progress here. 1. I decided early on I was going to have fun with this class. a change of attitude can go a long way. 2. The class was well paced. It was not like a full time job working on it. I could actually absorb the information rather than frantically careen from process to process. I really learned. My next class starts on Monday, and I'll be posting my progress on that class, too. Oh, yeah, and Happy 2011 to all of you. Just so you know, I've decided that, for me at least, this is the First Year of the Zierath. Look out, world. Here I come. 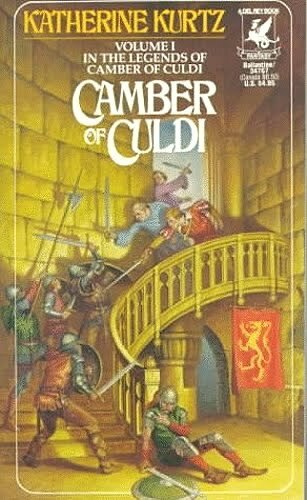 Camber of Culdi is one of the many books written by Katherine Kurtz. She has created a detailed world of the Deryni. The Deryni are people who have magical abilities, and they are currently in power over the rest of humanity. The plot of this book is of an older Deryni lord Camber and his family not thinking that the king is becoming a tyrant, killing 20 humans for every single Deryni life, and then killing Camber’s eldest son. The best way is to put the Haldane heir on the throne, if they can find him. It is a book of excitement, intrigue, and human loss and gain. It is quite well written. I give Camber of Culdi an A-. 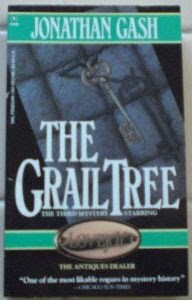 The Grail Tree by Jonathan Gash is the third of the Lovejoy books. Only two of the major characters of the previous book make it over to this one, Lovejoy himself and his helper Tink. Lovejoy opened up his expertise and hires a new apprentice – a beautiful young woman, of course. This book explains the ‘divvy’ angle a little more. Lovejoy is a ‘divvy,’ a diviner, able to look at something and immediately know if it is real or not. His beautiful apprentice can do that, too, but only with furniture. It’s an interesting difference. The retribution is as violent as it was the time before, with a tricky series of traps set up. It was a good read. I give The Grail Tree a B. 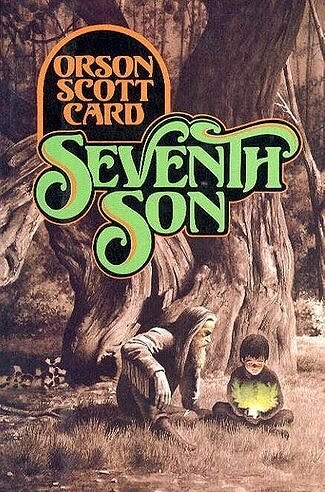 The Seventh Son by Orson Scott Card is the first book in an alternate North America. The United States does not exist. New York is still New Amsterdam, George Washington was Lord Potomac, a British lord, Thomas Jefferson was hanged for treason, and there is magic in the world. The story centers around the seventh son of a seventh son, a very significant number in magic. It is a story about Alvin, a strange little boy who is a Maker and who is destined to do great things; whether these are great and wonderful or great and terrible remains to be seen. The Unmaker, sort of an anti-life spirit, is trying to destroy him even before he is born, and continues to try throughout Alvin’s childhood to destroy him, whether through water or through people. I also enjoy finding out who the Talespinner, the Merlin-like figure in the story, is. In our world, he is my favorite poet; in that world, he is a wandering bard. You’ll have to read the book to find out who my favorite poet is. I give The Seventh Son an A-. I have been following the Marvel ‘Incredible Hercules’ comics for some time. They are some of the best that are out there right now. They mix a great deal of humor and drama into these graphic novels. This version of Hercules is one of the world’s biggest losers. 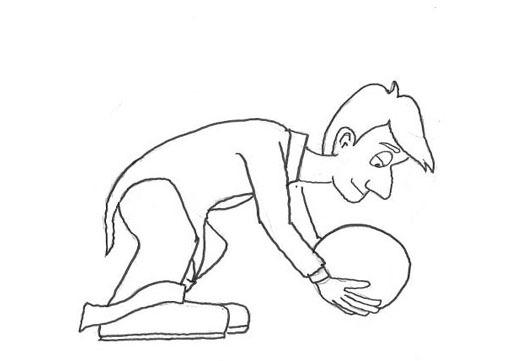 He has incredible power, naturally, but is not all that bright and fumbles his way through to victory. Written by Greg Pak and Fred van Lenthe and artwork by Rodney Buchemi, they capture a lot of the essences of the Greek myths and go back to a lot of the original material for character development. In addition to Hercules, the other main character is Amadeus Cho, the seventh smartest person on the planet. The interactions between Hercules and Cho are wonderful and entertaining. 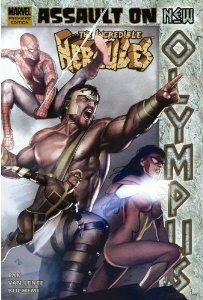 This particular graphic novel, Assault on New Olympus, is actually the seventh in the series. It is the culmination of Hera’s mad plan to destroy the world; the death and rebirth of Zeus; the love of Hebe, Hercules’ estranged wife (and Spider-man’s date); the New Avengers coming to his aid; and the mysterious plans of Athena, who has been guiding Hercules for 3000 years to get to this point. It does have a few extraneous moments, and the addition of USAgent (a Captain America wanna-be with no social skills) is always irritating. Overall, I enjoyed The Assault on Mount Olympus and give it a B+. With so much of my reading being science fiction and fantasy, I thought I should go back to a classic. 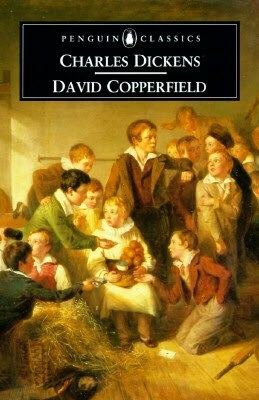 I went to my bookshelf and pulled out Charles Dickens’ David Copperfield. I had forgotten how dense the writing is. Very full of description to the point at times when I started reading it I felt like I was slogging through it. It took me a while to get into it and to get used to the writing style, but once I did I enjoyed it immensely. According to Dickens, it was his favorite book; many experts believe it was the most autobiographical of his books. It follows the life of David Copperfield, following him from early life with a gentle mother, loving nurse, and tyrannical step-father through his days at school through college and into adulthood. David touches several levels of society, from his nurse’s working class family to the merchant and white color workers to the very rich. Characters continue to recur throughout the book, and a seemingly throwaway character from his school days becomes one of his greatest allies later on. 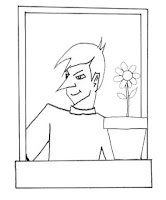 One entertaining piece of the novel is a young man’s ‘infatuation’ stages with beautiful women. Falling madly in love to the point of distraction and making a fool out of oneself. It is something that as an educator of adolescents, I have seen many, many times, and remember experiencing, I say with a certain amount of embarrassment. Overall, the novel is thick and wordy, but the storylines are fun, the characters very memorable. Even though I am a firm believer in the ‘Small World’ effect, there was a little too much coincidence in David Copperfield, even for me. Of course, the novel was written in an episodic format, with a new chapter coming out each month (much like a modern day comic book), and the coincidences would have a little less impact if read over several months instead of during a week of reading. Now feeling a little self-conscious, I, a humble writer and educator, give Charles Dickens, one of the greatest writers in the English language, a B+ for his novel. 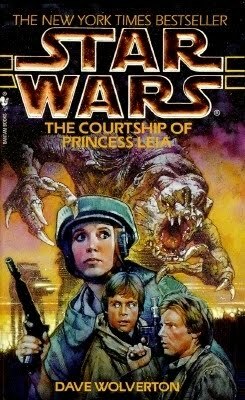 The final book I read during December was another Star Wars book, The Courtship of Princess Leia by Dave Wolverton. I was excited to get back to the Star Wars universe and to return to the main characters from the movie – Luke, Han, Leia, Chewbacca, R2-D2, C-3P0. I have to admit, however, after the rich descriptions of David Copperfield, Courtship felt a bit on the sparse side. In addition, the characters did not feel ‘right’ to me. My biggest gripe is the characterization of Chewbacca, who just happens to be my favorite character in the Star Wars universe. He is continually described as scared and fearful. I realize that in the first movie, bits of humor were used in his being afraid of the compactor creature, but in this novel, it was nothing but Chewie being a coward. I also have a problem with one of the main premises of the novel, which is Han Solo kidnapping Princess Leia when he thinks that she is falling in love with another character. I know Han is a rogue, but I just can’t get to him stunning Leia, smuggling her on board of the Falcon, and then fleeing to a planet to force her to spend time with him. Now, without that, there is no real story going on, and Wolverton does add some wonderful elements to the Star Wars universe, such as where the rancors comes from, and he introduces some characters whose descendants will become very important in the future stories, but overall I was disappointed by the novel. Even the confrontation between Zjinj and Han felt lacking. 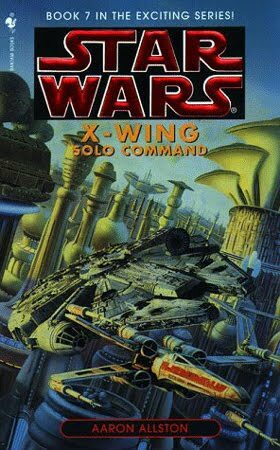 I did take a look to see when these books were written, and this book ending the fighting between Zjinj and Han was written five years before the big battles of the X-Wing sagas, so it’s understandable why the feeling of depth was not in there. It felt trite. Overall, I found The Courtship of Princess Leia disappointing, and I give it a C-.